“Sea is immensity. Painting is voice. Faith is future, Life is luck”. Thanks to the cultural links that undress art and offer it without any frontier to the future, we receive the words of Alfonso Cruz, a voice that dialogues from his wet material, from his lyricism, or perhaps, from the ocean that meets him often trying to take to the material parts of that immensity. 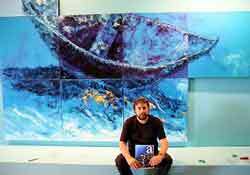 Cuba receives for the second time this artist, who was born in Terrassa, Barcelona, who is recognized all over the world for painting underwater scenes directly. The experience, unique in his country and only a few in history, gives him a reputation, that makes people look closer to a man who is beyond those preludes. The symbiosis between creation and diving was stated by the Scot Zarh Prichard over a hundred years ago, “It means to take the World of art to the biggest space on earth and, in my opinion, the least taken to the plastic. It is to tune in that space with my inner space in a kind of communion or link”, commented Cruz in a statement to Granma newspaper. “It gave me – he indicated – a wider open mind. I learned to recognize that a simple stain is a part of a very important speech. There is no need to define too much the things, you have to imply it”. That intention of suggesting more than saying – accomplished through the underwater painting from 1992 – probably determined that his work, which has been for 15 years a representative of the Spanish realism, added expressionist elements. Over 800 pieces and 100 personal and collective exhibitions, back the great career of the creator, who, with his usual calm appearance, but with the notable uncertainty created by the idea, confesses that he does not know if he will continue to paint the day he can not dive anymore. His facet as a literary is less known, but likewise successful. “The nakedness of poetry is very strong. In painting there are more factors that intervene: colour, forms, drawing, format, it requires an orchestration, although it is more universal in the sense that it does not need to be translated. Poetry, however, is to direct the words and it ends up belonging to those who read, not to those who wrote it”. Material, sea or poetry?, asked Granma. Cruz defended the third one, because – he explained – “it is a condition, without it, the rest of the art expressions would be empty, dead. It does not mean that I want to be remembered as a poet, but I do want to allow the poetry to invade all the rest aspects of my life, among them, off course, painting”. Underwater scenery of Isla de la Juventud, Ciénaga de Zapata, Jardines del Rey, Santa Lucía, Guardalavaca and Santiago de Cuba, have already received the visit of the painter, who with his palette and material joins forces with Teodoro Rubio – who has become an expert in the history of the Admiral Cervera Fleet -, Pedro Secorún, who is a journalist and director of the Catalonia program Thalassa, the sea, and the group of Mundo Latino, who give their best i the production of, among other things, a series of audio visuals for TV3 channel of Barcelona. The paintings created after these dives and other nine the author brought from his country, are added to the photos that show him in creative work, which were taken by the underwater researcher Jesús Vicente González, to conform an exhibition the city of Santiago de Cuba is offering from this month and that will later be showed in other parts of the country.